MANILA - (UPDATE) Movie actor and former senator Ramon "Bong" Revilla Jr was acquitted of plunder Friday after languishing in detention for 4 years. Revilla was accused of pocketing P224 million in kickbacks from fake projects with the help of businesswoman Janet Lim Napoles, who was convicted of plunder during a promulgation of their case on Friday. Then senators Revilla, Juan Ponce Enrile, and Jinggoy Estrada were tagged in a special report by the Commission on Audit as among those who allegedly endorsed part of their discretionary funds to bogus non-government organizations linked to Napoles. At the start of the Senate investigation into alleged "pork barrel" misuse, former COA Chair Ma. Gracia Pulido-Tan said Enrile, Estrada, and Revilla funneled part of their pork barrel funds to fake NGOs linked to Napoles. PDAF scam whistle-blower Benhur Luy claimed he transacted with the offices of Enrile, Revilla, and Estrada for Napoles. He also revealed that Revilla, hidden under the moniker "Pogi," received the biggest kickback at P224 million. The Department of Justice files plunder charges against the 3 senators, Napoles and several others in connection with the pork barrel scam before the Office of the Ombudsman. A list of government officials that Napoles claims she had transacted with was released by the Senate Blue Ribbon Committee. It included Revilla. The Ombudsman files plunder and graft charges against Enrile, Estrada, Revilla and several others before the Sandiganbayan. 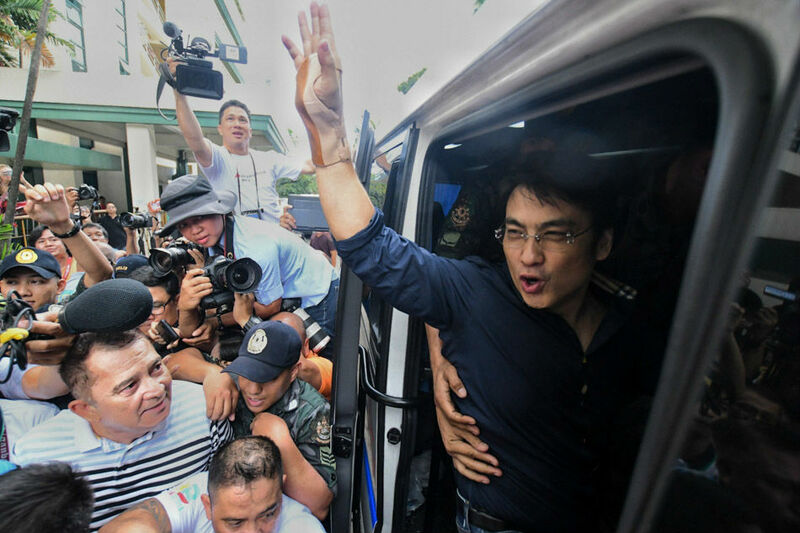 Two hours after the Sandiganbayan issues an arrest warrant against Revilla, the former action star surrendered to authorities at the anti-graft court. He was detained at the Police Custodial Center in Camp Crame on the same day. Estrada was arrested 3 days later while Enrile joined them a month later. Since their arrest in 2014, only Revilla remained in detention after Enrile was allowed to post bail in 2015 on humanitarian grounds while Estrada posted bail in September 2017. The Sandiganbayan starts the P224-million plunder trial of Revilla, making him the first legislator to be tried over the P10-billion "pork barrel" scam. Revilla claimed during the third day of his pluder trial that he was as much a victim in the PDAF scam as the witnesses who testified against him. "I have nothing to do with this. Alam nating biktima sila. Biktima rin ako [We all know they were victims. I'm a victim too]," Revilla said in a media interview after the hearing. Revilla denied before the anti-graft court that he received kickbacks from Napoles. "I never received money from Janet Lim Napoles at sa mga kasamahan niya (and her colleagues)," Revilla said. Whistleblowers Marina Sula, Mary Arlene Baltazar and Merlina Suñas apparently sided with Revilla as they claimed that they did not see the former lawmaker sign the supposed endorsement letters for PDAF projects. The 3 prosecution witnesses instead claimed that it was actually their fellow whistleblower, Benhur Luy, who signed some of the documents. The Sandiganbayan ends the plunder trial. Revilla was cleared of plunder and was released from detention on the same day. The court's decision marks the first resolution of a PDAF scam case since the Ombudsman began filing charges in 2014. Revilla however is still facing graft charges.